The Moland swept profile is a straight edged, elegant canvas or panel frame. The corners are decorated with a fleur & leaf motif and the inside sight edge is beaded. The sides are scooped and the finishes are darker in the recesses. 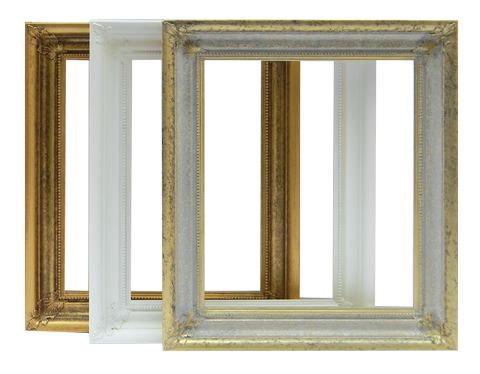 These Frames come in 4 sizes and in 3 finishes. The Gesso finish is a super smooth Gesso, ready to gild or leave for a bright white. The Gold is a slightly mottled gold over a darker underleaf. The Ivory Pale Gold is a gold wash over an Ivory base. Rebate depth 24mm to suit standard bar canvases. Supplied frame only no glazing. To order online please see the Contact Us page, where you can submit an order and we will confirm by email or phone.